For a long time Seine Saint Denis was a rural area and managed to preserve many of its older sites, as can be seen in "Le patrimoine au quotidien". 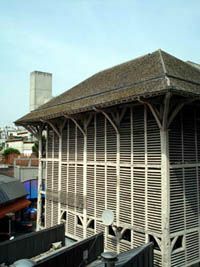 Regarding industrial heritage, only the maison des arbalétriers in Saint-Denis, is evidence of the beginnings of an industrial heritage in the eighteenth century. Real industrialization in Seine-Saint-Denis took place during two major periods in the following centuries. The first from 1840 to 1890 remained closely linked to the essential role of the canal de Saint-Denis and of the canal de l’Ourcq, and then to the development of the industrial rail network in La Plaine-Saint-Denis. Even though, during that period, almost all activities were present, the chemical industry Saint-Gobain in Aubervilliers and the metallurgy company - PSA Peugeot-Citroën at Saint-Ouen dominated the sector. Other companies remain iconic such as Christofle in Saint-Denis or Manufacture des Allumettes in Aubervilliers. That period also appeared as one where storage function, the Magasins généraux de la Plaine-Saint-Denis, answered to this functional organization associating canal and railway. Once the depression was over in the years 1860-1890, a second wave of industrialization began and lasted till 1940. The development of the railway network infrastructure in the North and East was a decisive factor in the implantation of big factories of metallurgy and mechanics. It was in 1907 that Johnson establishments set up in la Courneuve, manufacturer of machine tools to make shoes, Mecano factory in La Courneuve or Grands Moulins de Pantin. During the industrial era, architecture played an important role. Some architects were specialists in this type of construction such as Jules Saulnier, general contractor for several of the buildings in the Meunier chocolate factory in Noisel, and who was also involved in the construction of the Central Pharmacy Saint-Denis. On the other hand, buildings became the symbol of the use of certain materials, such as brick with the old printing house L’Illustration in Bobigny, or with the typical shape of a factory, such as the vaulted roof or saw-tooth roofs of the Alcohol Docks in Saint Denis.